Would Cinderella wear this to the ball? Novel to some extent, good looking timepiece although subjective. It's a fad, the novelty will run out. Although less expensive, it is still quite a handsome sum which could land you a more significant timepiece. Hublot throws its lot into the ring with its ‘s Big Bang Unico Sapphire. 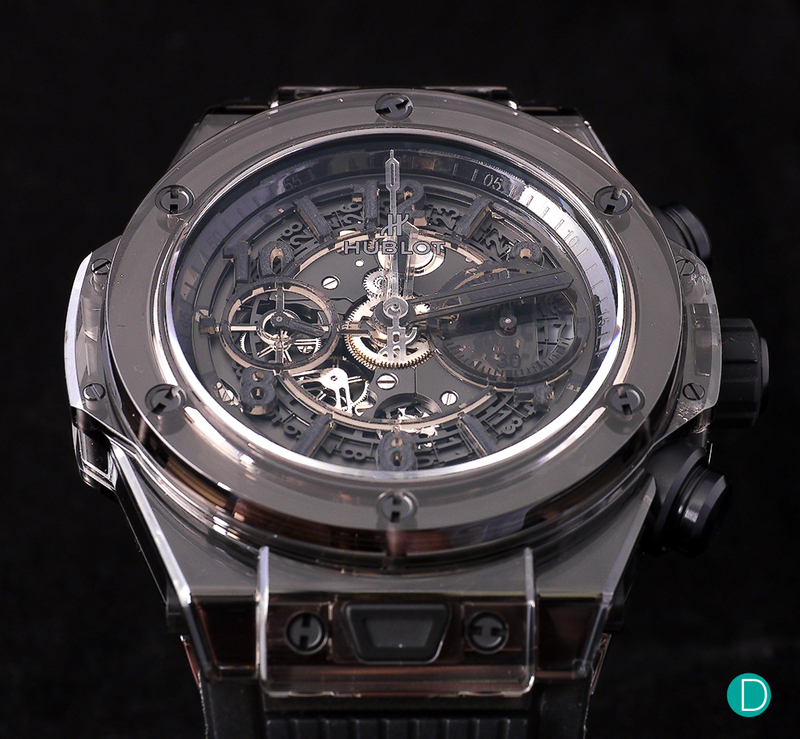 With this new entrant, Hublot builds a foothold in the new fad of fancy watch case materials, the arms race of the Sapphire crystal. Other high-end or rather highly priced brands like Richard Mille and MB&F have also joined in the match. Richard Mille’s RM 056 in sapphire is in the 7 digit price range while MB&F’s HM6-SV is almost half a million dollars. 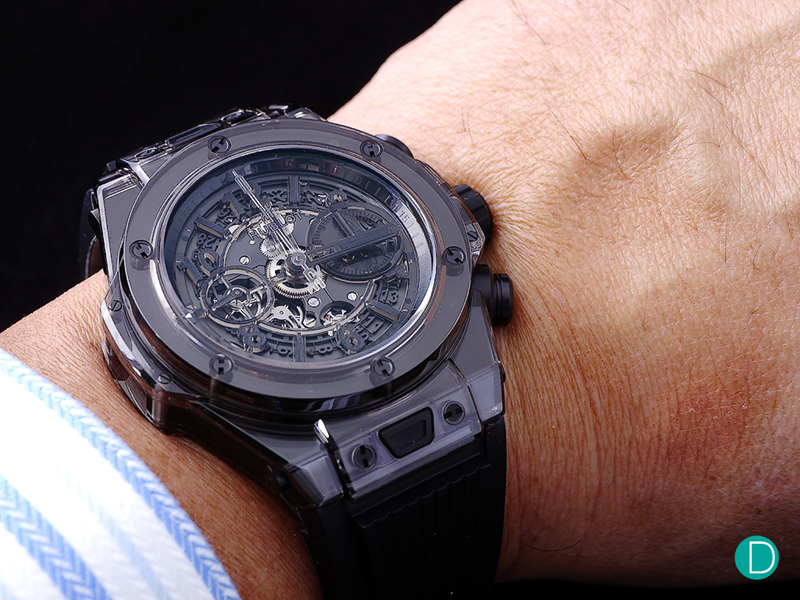 The Hublot Big Bang Unico All Black Sapphire. Hublot’s Big Bang Unico All Black Sapphire is priced at US$57,900, understandably a fraction of the price demanded by the other brands. Then of course, Hublot’s Big Bang Unico Sapphire is unlike the other brands mentioned, be it in type of complication or the number of limited editions. While Richard Mille and MB&F offer less than 100 sapphire pieces combined, Hublot’s Big Bang Unico Sapphire and Big Bang Unico All Black Sapphire is limited to 500 pieces each. That is a 1000 pieces limited edition. Not that this strategy of limited editions is anything new to the brand. 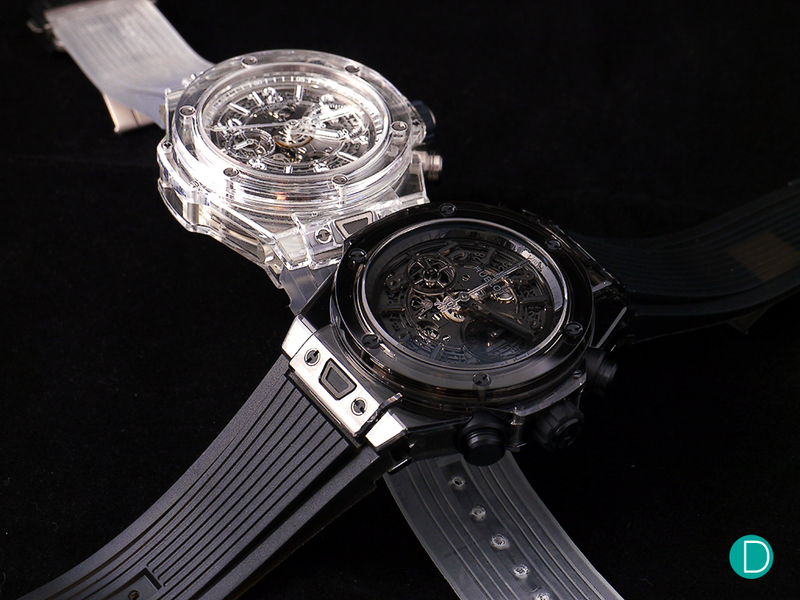 The Big Bang Unico Sapphire and the Big Bang Unico All Black Sapphire. Both models are limited editions of 500 pieces. But of course, we should not be too taken away by the brand’s marketing strategy but rather stick to a critique of the product. So, yes, as with all press releases found everywhere, we will tell you how sapphire crystal is an extremely hard material and it takes trillions of dollars to research how to cut it and put it in a case. The case from top to bottom is cut from blocks of sapphire, apart from the dial and the integral parts of the watch, the screws, crown and the buckle. 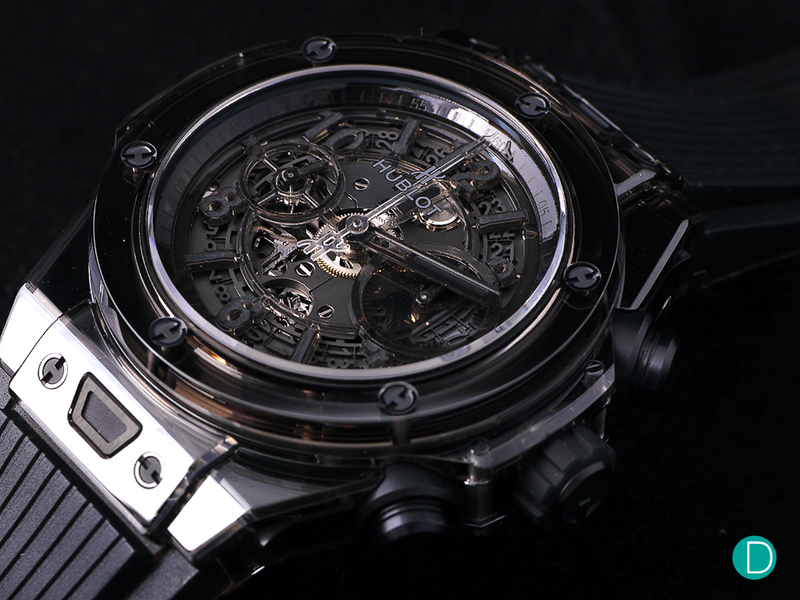 The skeleton dial is made from transparent resin and reveals the dial side movement plate and date wheel. 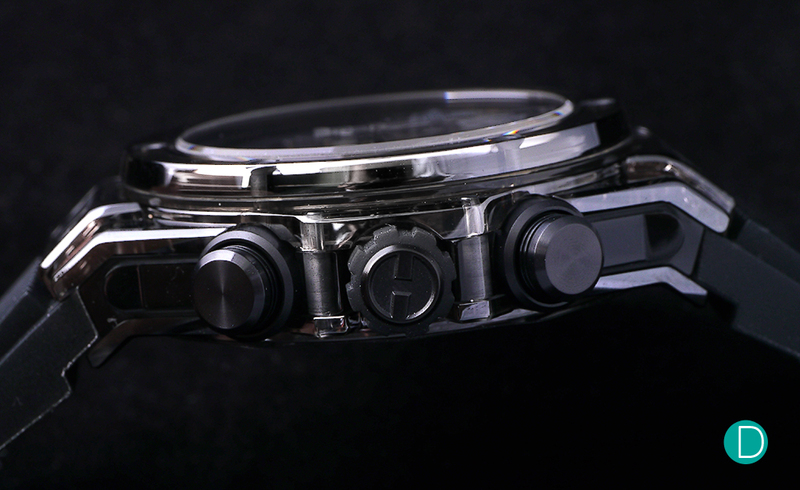 The watch is cased entirely in sapphire crystal less for the integral parts like the screws that are titanium. Minus the negativity we have with how the watch is marketed, we actually like how the watch is made. 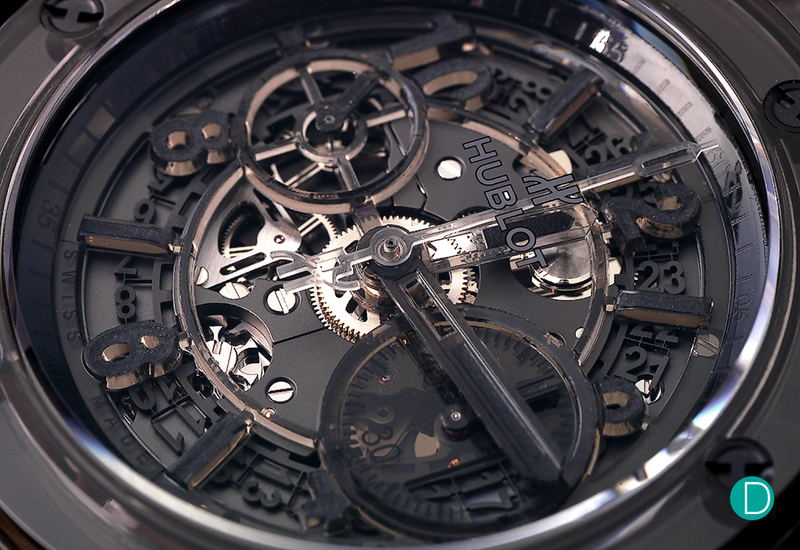 The resin skeleton dial is well designed to match the case, and the choice of colours, an All Black piece resonates with the brand’s icon which was the very collection that put Hublot back on the map. While the casework is not drop jaw gorgeous, the notion that the case is cut from a solid block of glass, should be credited. The display glass is also made with sapphire crystal and bears double sided anti-reflective coating. The side profile shows the Big Bang construction with the titanium screws holding the three piece construction together. The watch uses Hublot’s in-house flyback chronograph movement the HUB 1242 UNICO. The automatic movement has a column wheel deliberately made visible from the dial side and has approximately 72 hours power reserve. What is special about the movement however, is its easily interchangeable modular escapement with a silicium escapement and pallet fork that requires no lubrication. This feature makes the watch easy to service and reduces customer wait time. Other interesting features of the movement include a bidirectional winding system and a 60 minute counter instead of the traditional 30 minute counter found on bicompax chronograph dials. 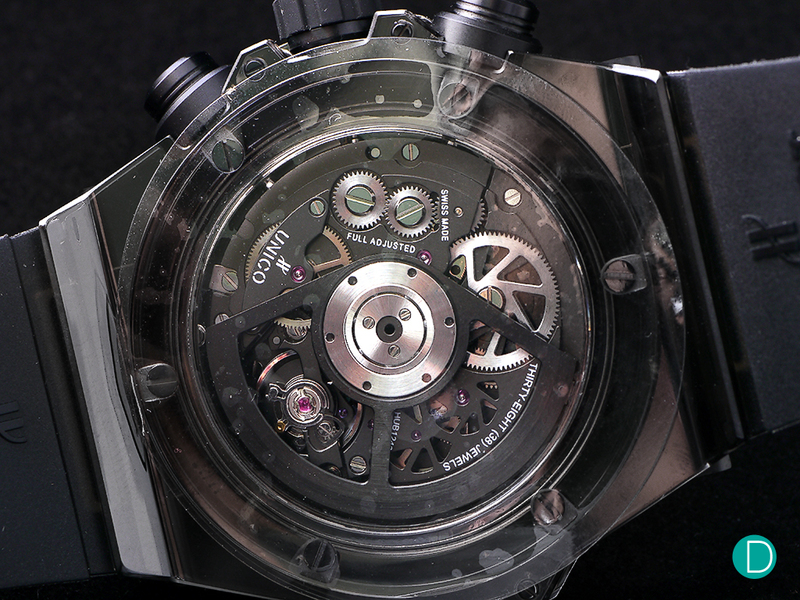 The transparent dial is made with resin, and reveals the date wheel and dial-side plate of the Unico movement. 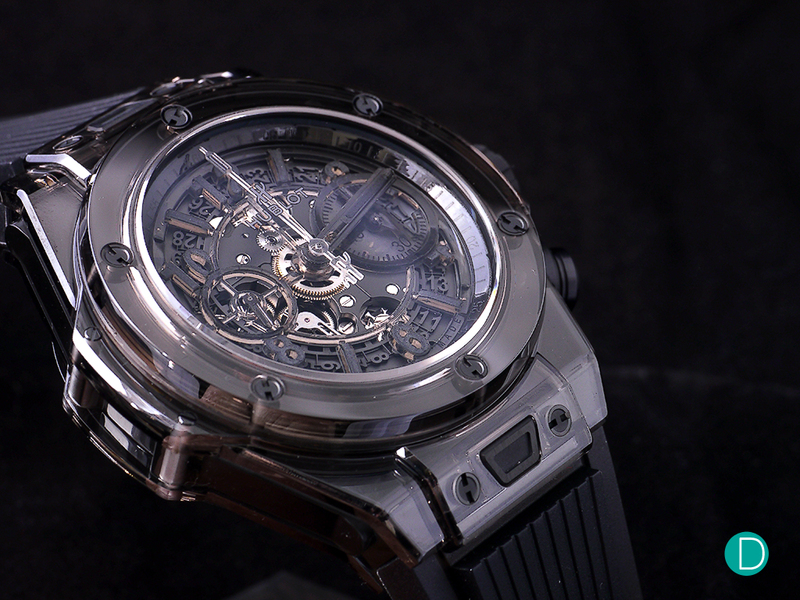 Hublot’s in-house Unico chronograph movement with approximately 72 hours power reserve. The darkened metal rotor and bridge parts of the movement reminds us of the Tag Heuer 02T, the latest tourbillon model by the brand. The cut out rotor, black colour theme, sporty chronograph look inspires a comparison of the sister brand’s similar offering. 45 mm on the wrist, with the black version, we find, more masculine than the white. All in all, we like how Hublot is positioning itself as the creative brand that is at the forefront of case material innovation. We like the watch, its case, design and movement. That said, we have qualms with supporting yet another fad, like the bronze and carbon fibre cases, to the forged carbon etc. These trends do not last, and the novelty to its owner will run out. To make things worse, these exotics usually carry heavy price tags that could be spent on many better things, watches or otherwise.